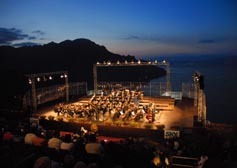 The current Ravello Festival derives from a series of previous initiatives which make it the oldest of the Italian festivals after the Maggio Musicale Fiorentino. Girolamo Bottiglieri and Paolo Caruso are to be attributed with the idea of the cultural event which, more than any other thing, has contribute towards building the identity of Ravello as a "Città della musica". Dance, theatre, music, architecture and visual arts congregate in Florence's old Stazione Leopolda for the 12th edition of Fabbrica Europa. Maggio dei Monumenti (May of Monuments) is an annual festival sponsored by the Council of Naples, with special events taking place every weekend during the month. Primarily, museums and special monuments open for free, but due to the event's success, lots of different activities have made the city the place to be. To pay tribute to the legendary tap dancer Bill Bojangles Robinson, in 1989 the US Congress made 25th May, his birth date, National Tap Dance day. Rome has been joining the celebration for the past 10 years with its own Tip Tap Show, which takes place at Teatro Sistina. Situated in the green heart of Umbria, Spoleto is taken over by a whirlwind of artistic activity during its annual festival: enjoy quality classical music, theatre, ballet, visual arts and cinema in a beautiful, romantic city that invites leisurely strolls at dusk. Details of the programme can be found on the event website once they are released. The Ravenna Festival presents original productions of opera, concerts, dance, jazz, ethnic music, drama and cinema, conferences, exhibitions and even the production of historical critical essays and their publication. It is music, however, that dominates the scene. Each summer, as part of its regular programme, English-speaking theatre troupe the Miracle Players performs a new comedy in the ancient splendour of the Roman Forum. After The History of Rome, The Emperors of Rome and Cleopatra comes Caesar - more than just a salad written, once again, by co-founder Denise McNee. For the second year running, Kals'Art brings music, cinema, theatre and guided tours together in a two-month long event that takes place throughout Palermo's streets, parks, piazzas and historic bulidings. The Marghera Summer Village has become a traditional fixture on the summer calendar in the Veneto region. The town organises parties, concerts, world music, cabaret, discos and more. The annual Festival Internazionale del Teatro Urbano invades streets all over Rome, aiming to transform urban spaces into theatre spaces and the pedestrian into the extraordinary. 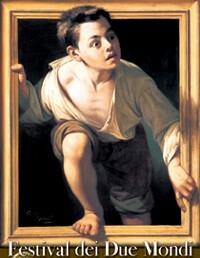 The first day - the "off" festival - is dedicated to young performers and alternative theatre. After the success of the first Roman Notte Bianca, the Eternal City stages even more visual arts, music, dance and theatre events throughout the night, while shops and eateries also stay open all night long. Jazz, musicals, theatre and much more make up this summer-long festival, taking place at two of Alghero's historical venues - the Anfiteatro Maria Pia and the Forte della Maddalena - both in the heart of the city, right by the seaside. The varied programme at the Estate Romana Festival offers jazz, rock, classical music, film, sport, theatre and children's fun to fill Rome's balmy evenings. Events take place in parks, courtyards, art galleries and around monuments throughout the city, with giant screens erected to show popular films at late-night viewings. The International Theatre Festival, this year directed by Romeo Castellucci, features a series of events (up to nine a day), including shows, appearances, installations and performances developed around a central nucleus: representation. The RomaEuropa Festival is a huge cultural undertaking, spanning dozens of theatre, music and dance events throughout the city. Situated in the green heart of Umbria, Spoleto is taken over by a whirlwind of artistic activity during its annual festival: enjoy quality classical music, theatre, ballet, visual arts and cinema in a beautiful, romantic city that invites leisurely strolls at dusk. The programme consists of classical music, jazz, dance, ballet, opera, sacred music, puppetry and film. Concerts in the Piazza and the Cathedral Square span 500 years of music from the delicate tones of Gabrieli, via Prokofiev's humor and the rigors of Bach to the intriguing lightness of Barber's Summer Music. Nor are the classics forgotten with works by Schubert, Beethoven, Schumann, and Mendelssohn forming part of the concert programme. In the stark and moving Romanesque basilica of Sant'Eufemia, visitors can enjoy a varied program of medievalliturgical chants, Byzantine ecclesiastic music, and traditional Slav sacred music. In the Piazza two operas are given concert performances by the New York Juilliard Orchestra. They are Handel's Oreste and The Emperor of Atlantis by Viktor Ullman. In the ancient Roman Amphitheatre (Teatro Romano), Dance Brazil perform along with the Ballet Hispanico. Meanwhile the Colla Marionette Theatre bring their new show to town. Ali Baba boasts brightly-colored costumes, elaborateset designs and sophisticated gadgetry - the hallmarks of this father and son team. The film programme features homages to Ingrid Bergman and Jeanne Moreau.